Taiwanese laptop brand MSI has revealed its latest all-in-one 3D ready PC and a new gaming laptop, both of which are set to be on show at next month's CeBit show in Germany. The new GT660 high-end notebook from MSI packs in pretty much everything you could want to make your latest PC games shine – including an Intel Core i7quad-coreprocessor, GeForce GTX 285M graphics, a possible 12GB of RAM, three RAM slots and a number of USB 3.0 ports. It doesn't have a 3D-ready screen, but hey, if 3D is what you are looking for, then you might be more interested in MSI (and the world's) firstfirst Full HD 3D all-in-one PC. 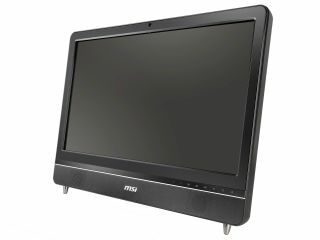 "At CeBIT 2010 the world's largest computer exhibition, MSI will display a series of powerful All-in-One PCs featuring the newest Intel Core processor and state of the art ATI 3D graphics with Direct 11 features," reads MSI's release just in. "MSI will also reveal the world's first large-sized 3D All-in-One PC with powerful computing capabilities. A 120Hz LED panel and 3D Shutter Glasses perform flawless and highly detailed 3D images"
MSI is therefore the first company in the world to announce an all-in-one PC with a 3D touchscreen. "The combination of a 120Hz LED panel and 3D shutter glasses brings the kind of 3D video experience into your home that you would normally only expect from a modern 3D movie theater." MSI will also be demo'ing the new high-performance Wind Top AE2420 and AE2280 all-in-one PCs at CeBit this year, 22- and 24-inch models that are equipped with the latest Intel Core processors and Intel's Turbo Boost technology, "which automatically adjusts the processor frequency, ensuring maximum performance for each type of application while also saving energy." For more on what MSI has in store for CeBIT 2010, head over to event.msi.com/cebit_2010.